Background: There is a diabetes epidemic in Asia. Approximately 25% of patients are treated with insulin, however their glycaemic control remains unsatisfactory and the fear of hypoglycaemia remains a barrier for its improvement. Vildagliptin is a DPP4 inhibitor with proven efficacy and low risk of hypoglycaemia. Considering the pathophysiology of type 2 diabetes (T2DM) in Asians, it is of interest to characterise the response to vildagliptin therapy combined with insulin in this population. Methods: Vildagliptin 50 mg bid added to insulin with or without concomitant metformin therapy was studied in a 24-week, global, randomised, double-blind, placebo-controlled study. We present a post-hoc analysis of 173 Asian patients with T2DM who participated in this study (38.5% of the overall study population). 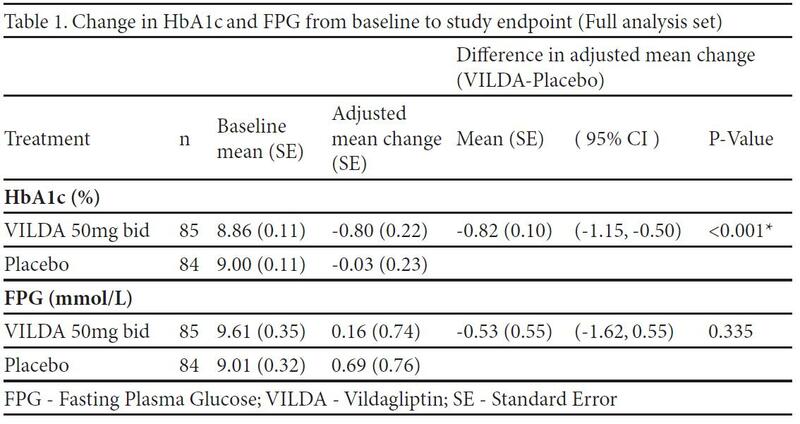 Change in efficacy endpoints, HbA1c and FPG were analysed. Changes in body weight, safety and tolerability were also evaluated. Results: 87 patients received vildagliptin and 86 patients received placebo. Patients were 54.5 years old, with T2DM duration of 11.6 years and BMI 26.4 kg/m2. The mean duration of insulin use was 3.6 years (mean dose was 39.5 U/day). The between treatment difference in HbA1c was 0.82% (p<0.001) in favor of vildagliptin. There was no significant difference in the change in FPG between treatments (Table1). The weight was stable in both treatment groups (change from baseline to endpoint 0.3 kg and -0.2 kg, for vildagliptin and placebo, respectively). Incidences of hypoglycaemia were similarly low (8.0% vs 8.1%) and no severe hypoglycaemic events were experienced in either group. Conclusion: In Asian patients inadequately controlled with insulin (+/- metformin), insulin-vildagliptin combination treatment resulted in a significant reduction in HbA1c compared to placebo. This improvement in glycaemic control did not put patients at additional risk of hypoglycaemia or weight gain. These findings are in line with the results of the overall population in the study.